To be honest I have no idea now how autumn will look like here in SoCal... I've been living for 13 years on the East Coast and I am pretty sure it won't feel anything like that. It will be the first autumn where probably I won't see leaves falling, temperature dropping to 40s or people unpacking blankets and sweaters. Well, at least the days will start to get shorter, that's something and guess what? The Whisky Extravaganza Fall Chapter..! Done... 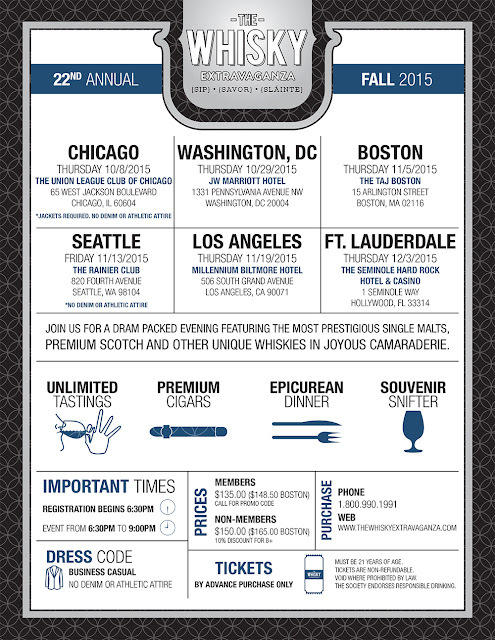 The Scotch Malt Whisky Society will be bringing 22nd Annual Whisky Extravaganza to Los Angeles on November 19th. It will be another hell of an evening like every year of unlimited whisky tastings, extraordinary dinner buffet and friends from all over the world. It's definitely an unmissable chance to sample the newest releases of participating distilleries, blenders and independent bottlers, to meet the brand ambassadors and whisky enthusiasts. The event will be held at Millennium Biltmore Hotel, Downtown Los Angeles. 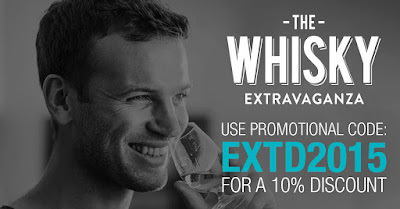 Believe me you don't want to miss this evening, especially with the discount code I will give right now... Take your pens and note this: The code "EXTD2015" will bring a 10% discount to all tire-bouchon readers for any The Whisky Extravaganza event when you order your ticket. You can purchase your ticket directly from this link, by visiting The Whisky Extravaganza's website or simply by calling the number (800) 990 1991. All events start at 6:30pm and end at 9:00pm. Don't be late for registration not to miss any minute of the night since it starts at 6:30pm. Put your kilts on if you are seeking extra attention, always a winner... Remember it's on Thursday, November 19th. Make sure to find me there to chat and/or to share a dram..! Slainte..!